There are few events more thrilling in the automotive industry than SEMA, one of the most elite and exclusive automotive trade events in the world. For a few days each fall, the brightest, most innovative minds in the industry—and all the most exciting new products—converge at the Las Vegas Convention Center for product demonstrations, unique events, and opportunities to network. The 2017 event saw more than 70,000 attendees, with over 3,000 newly introduced products, and the 2018 event has proven itself to be equally exhilarating. This 1969 Chevrolet suburban will be fully restored for SEMA 2019—and you can help choose the build! K&N has been featuring several new products at this year’s show, including the ECI system (electronic carburetor injection), and the soon-to-be-available Boost Control Module and Throttle Control Module. 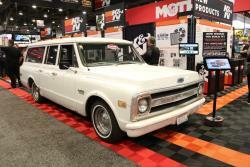 In addition, the K&N booth included a custom-built Yamaha RD400, a 1969 Chevrolet suburban (which will be fully rebuilt for the 2019 show! 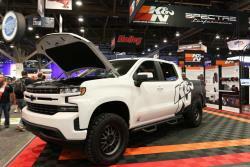 ), and a 2019 Chevrolet Silverado with a custom prototype intake system. The K&N ECI is a bolt-on system which adds a supplemental fuel source to improve engine performance. Comprised of a spacer plate with a fuel block and injector, an electronic control unit (ECU), and wide-band oxygen sensor, installation can typically be completed in a matter of hours. Better yet—after setting five simple parameters, the system can tune itself. After installing your new ECI system, hiccups on cold starts can be a relic of the past. The K&N Throttle Control Module processes input data from the gas pedal and bypasses the factory signal to the vehicle’s ECU, sending a modified signal directly to the throttle body—creating an increase in throttle responsiveness that will make your car feel like a whole new machine. K&N’s new Boost Control Module works within factory parameters to increase boost—improving throttle response, and offering a power increase of up to 47 horsepower. The system can typically be installed in less than 30 minutes (no software required), and is adjustable on-the-go—helping you fine-tune your boost level to your preferences and needs. When you need more power, simply adjust the dial to give your acceleration a bit of extra muscle. K&N also introduced a new black oil option as a companion to the traditional red oil—allowing enthusiasts of blacked-out engine bays to customize their cotton air filter’s aesthetic to their preferences. Nick O’Kane, a National Account Manager at K&N, introduced a custom Yamaha RD400 at the K&N booth at SEMA this year—a collaborative project with his son, Max, for his senior project at Riverside STEM Academy in Riverside, California. The Yamaha RD400 air-cooled twin was launched in 1976 as a slightly more refined version of the Yamaha RD350. The bike was an instant hit, and highly sought after by many riders. This minimalistic, retro racer RD400 came to life after O’Kane purchased the bike (in boxes) from a garage sale at Jeff Palhegyi Designs. JPD Designs had completed the frame modifications to convert the RD400 from twin-shock to mono-shock, which included fabrication of custom swingarm and triple trees to fit the race wheels from Marchesini. The gas tank had also been extended and tail unit designed to match. O’Kane and his son greatly enjoyed finishing the build, and adding their personal style to a solid foundation. Together, they would like to thank JPDesigns for their assistance with the build project. The research and development department at K&N created a prototype intake system for the 2019 Chevrolet Silverado—so keep your eyes out for a product release in the near future! 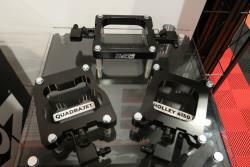 K&N designs every intake system to provide increases in horsepower, helping you take your new (or new-to-you!) vehicle to its performance potential. 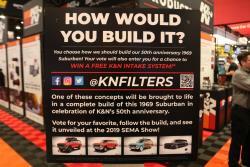 K&N also introduced a build project that will be completed for SEMA 2019—a 1969 Chevrolet suburban—and has left it up to the public to decide from four awesome build choices. You can vote for your favorite option by following this link, and you’ll also be entered to win a free intake (please click on the link for full terms and conditions)! The entry period ends at 11:59 p.m. PST on November 11th, 2018. Be sure to follow K&N’s Facebook page and Instagram to view exciting footage and images from SEMA 2018!